Delete or shred files in bulk with Deletor using a window or a command line. Deletor 3.1 is file & disk management software developed by Basta Computing, Inc..
Deletor helps you keep your disks clean by deleting or shredding files corresponding to file name patterns or extensions that you specify. Deletor also has support for filter packs, which allow you to store sets of your most commonly used file deletion specifications. Combine this with file date filtering and command line access to the program, and you can easily automate the cleaning process with batch files, shortcuts, or a scheduler. This program is shareware, which means you can download and use Deletor 3.1 for free during 30-days trial period. After this period you gonna have to buy Deletor 3.1 software for $15.00 or uninstall the program. Deletor 3.1 supports English interface languages and works with Windows 98/XP/Vista. Latest Deletor 3.1 does not contain any spyware and/or advertise modules, allowing installing it with no worries concerning valuable information loss. Our website has thoroughly tested system utilities product Deletor 3.1, written the review and uploaded installation file (458K) to our fast server. Downloading Deletor 3.1 will take several seconds if you use fast ADSL connection. 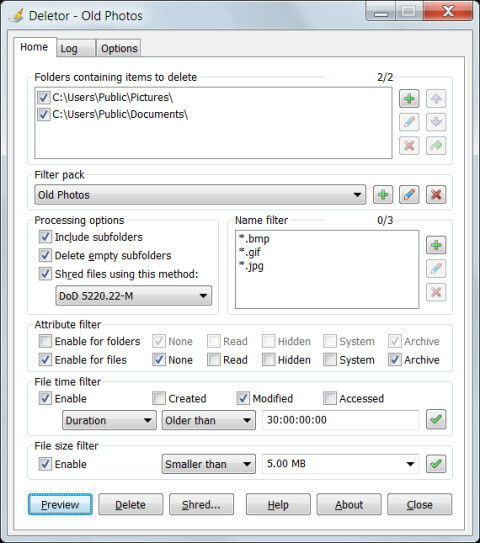 UtilityDog is a powerful utility that gives you unprecedented control over finding, viewing, and manipulating the files and folders on your disks. Recover all Important Data Deleted Accidentally or Lost Due to System Crash.